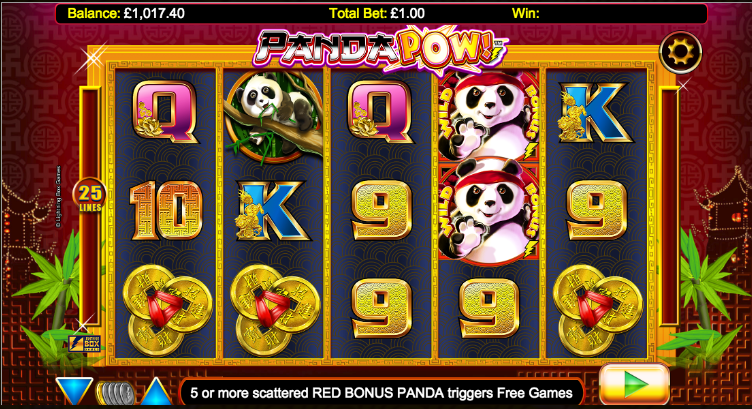 Pandas are generally seen as quite lazy creatures who spend their days sleeping and munching bamboo shoots but there are some who practise various martial arts disciplines and one such creature is the theme of Panda Pow!, an online slot machine from Lightning Box Games which offers a generous free spins feature and some exciting gameplay. Panda Pow! 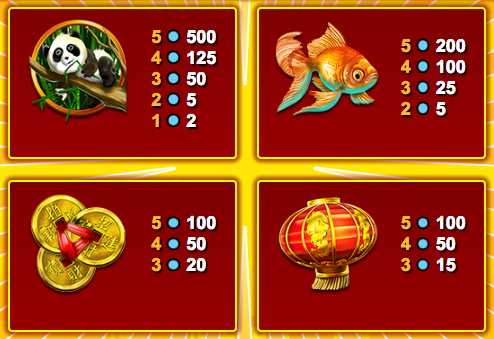 is a five reel slot with three rows and twenty five fixed paylines; those reels rotate within an ornate, solid gold frame which sits on a patterned red backdrop accessorised with bamboo leaves and brightly lit temples. The higher value symbols include a panda on a branch, a goldfish, some gold coins, a Chinese lantern and a blue fan; 9, 10, J, Q and K represent the lower values. The wild symbols is also the scatter and it’s a panda with a red bandanna; it will substitute for all others to form winning combos and it appears only on reels two, three and four. A new stacked symbol – the wild golden panda – is now added to reels two, three, four and five and it will substitute for all others except for the panda wild/scatter. More spins can be won by landing three more triggering symbols during this round. Panda Pow! is a high quality slot with some typically oriental sound effects and a cute main character who is doing his best to win you some free spins although you’ll need to trigger the higher numbers for some bigger wins. This game comes with an RTP of 95.51%.